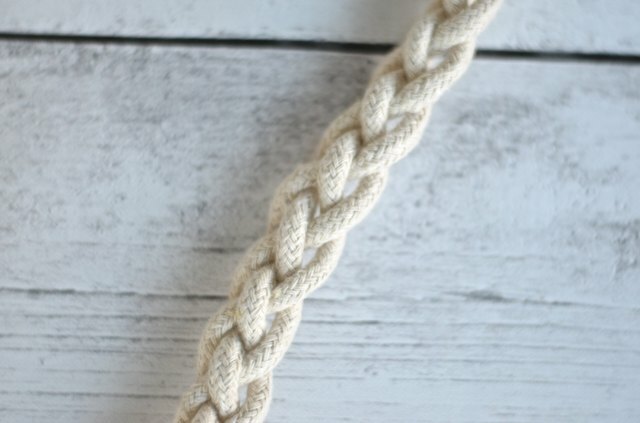 Turn a plain thrift store mirror into an ornate wall hanging with ropes and an arsenal of sailor's knots. 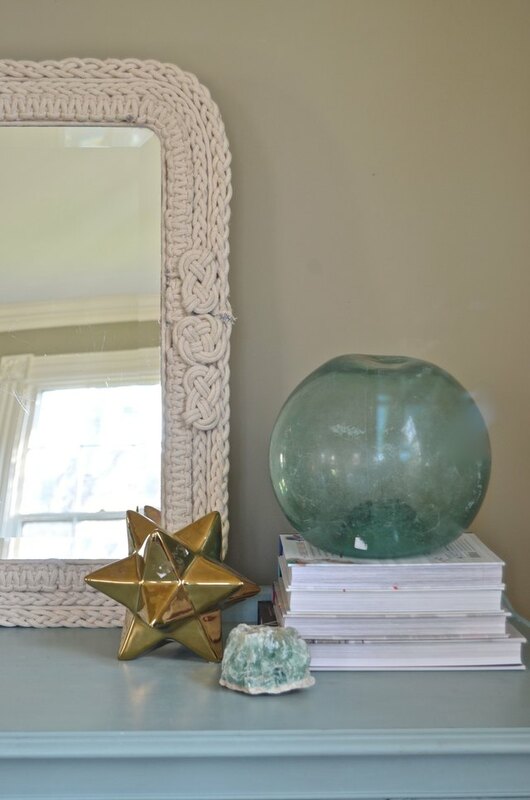 The eclectic texture combined with a neutral color palette means this do-it-yourself roped frame can hang in any room whether casual or more formal. 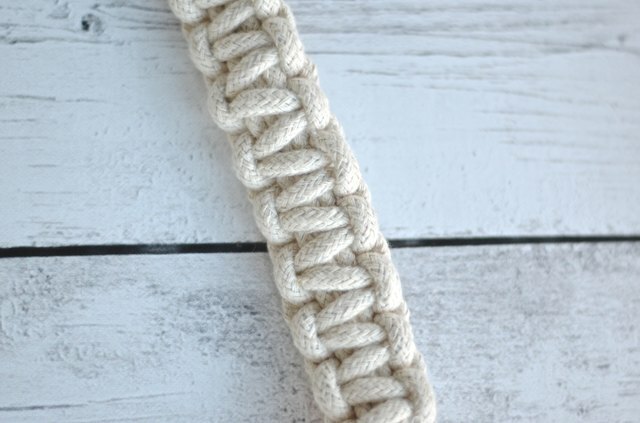 Repeat the above macrame weaving pattern until you run out of the left and right weaving strands. Cut two more lengths of 4-foot rope and repeat Step 1. Continue until the length of macrame is long enough to stretch the circumference of the mirror (80 inches in this example). 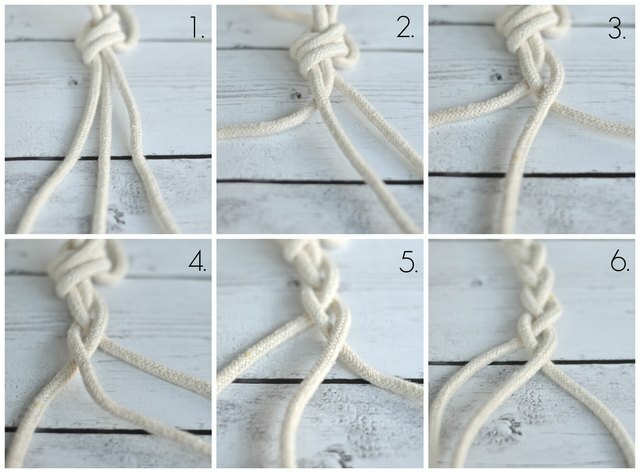 Use tape to hold the ends in place when adding each new section of macrame. 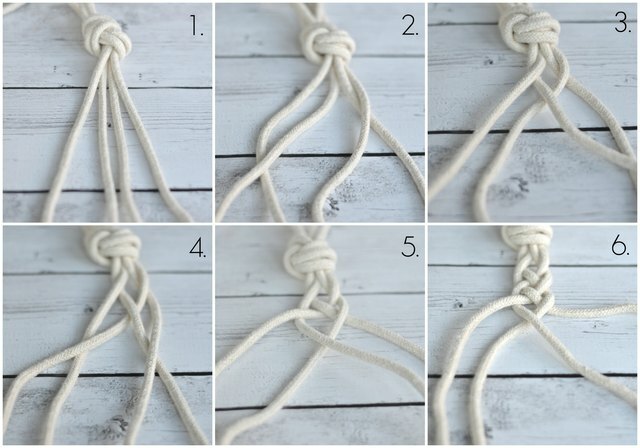 Wrap the excess rope into bundles to make it easier to weave with. Cut two lengths of rope approximately 36 inches long each. 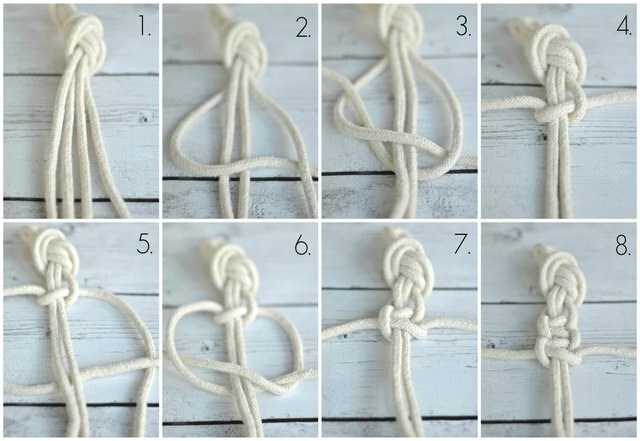 Fold over the first length of rope and create a loop. (See 1) Fold over the second length of rope and bring it over one end and under the other end of the first rope. Tuck the tail of the second length of rope under the loop formed by the first length of rope. (Step 3) Bring the end of the second length under the loop formed by the first rope. (See 4) Take the end of the second length of rope and weave it over the first length of rope, under the tail of the second length, and over the top of the first length of rope. 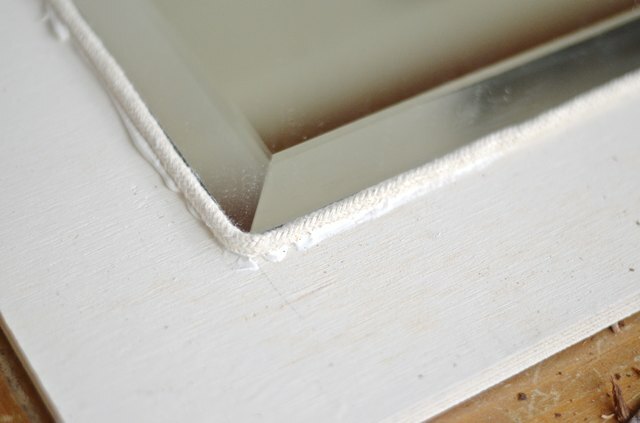 (See 5) Pull tight, (See 6) trim the ends and secure with a dab of hot glue underneath. 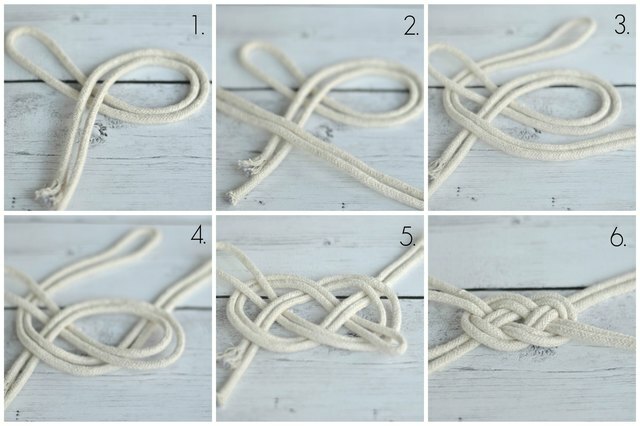 Make four figure-8 knots. 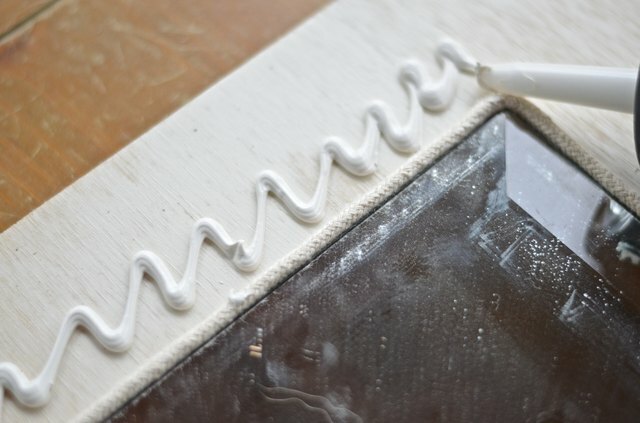 Use the hot glue gun to help secure the ends of the lengths of rope. Start with one length of rope about 3 feet long and make a loop with one end. (See 1) Take the right end of rope and bring it under the loop and over the left-hand tail of rope. (See 2) Bring this same end of rope and weave it under, over, under and over the loop and rope tail. (See 3 and 4) Pull slightly tight. (See 5) Follow the pattern of the first rope with the remaining end of rope to double up on each rope line. (See 6 and 7) Pull tight, trim the ends and secure with a dab of hot glue underneath. 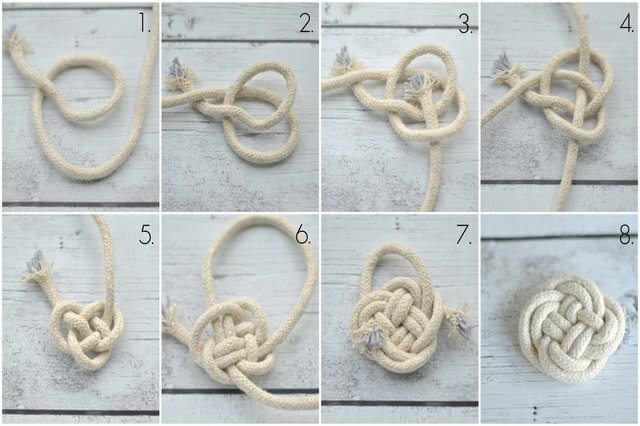 (See 8) Make two clover knots. 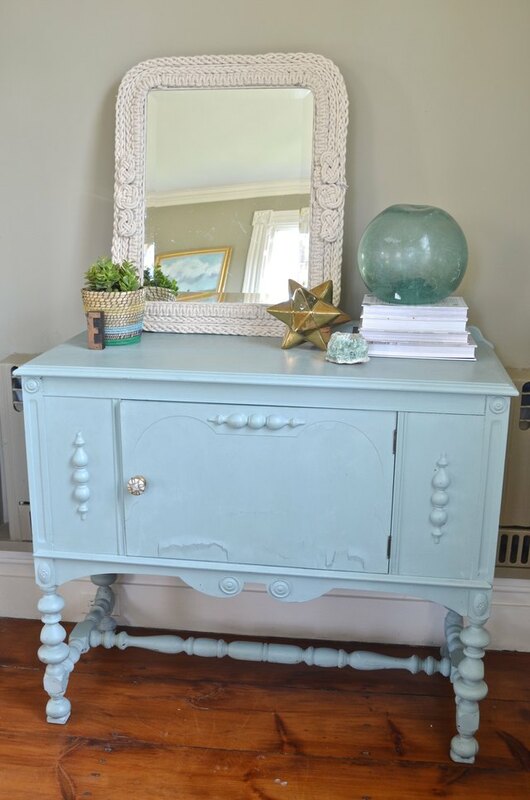 Give the wood a light coat of off-white spray paint and apply the Liquid Nails in order to glue the mirror onto the plywood. Center the mirror, leaving 3 inches all around. 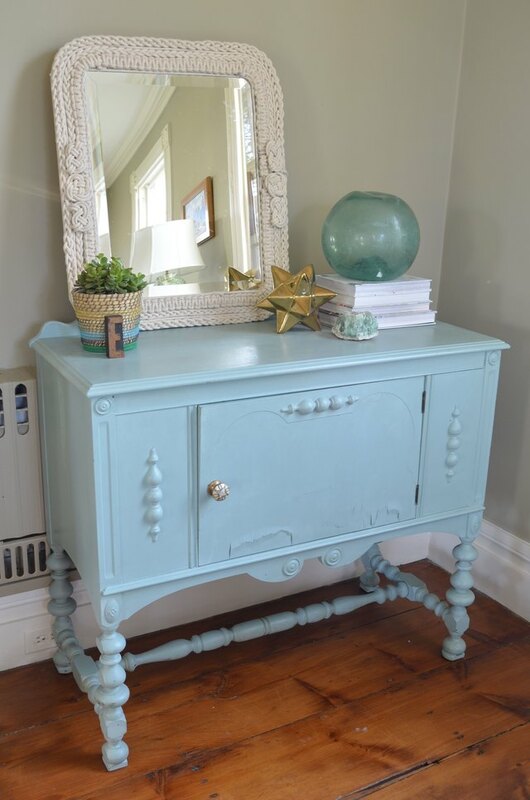 Gather some heavy books to weigh down your mirror while the glue is setting overnight. 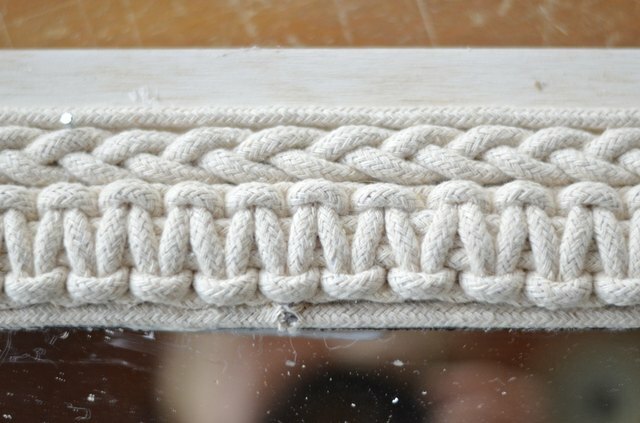 Apply a bead of Liquid Nails around the edge of the mirror and glue down a single strand of rope (approximately 75 inches of rope). 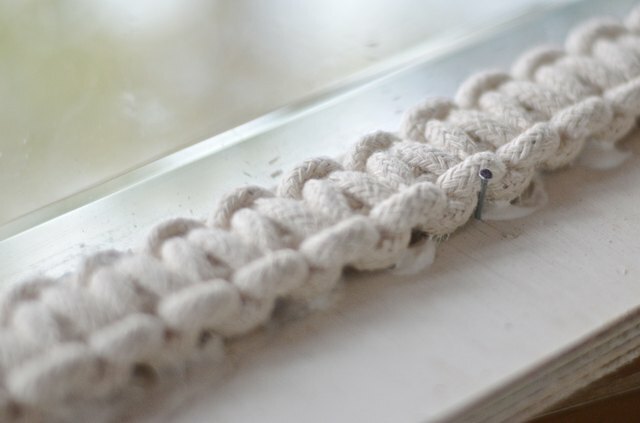 Glue the thickest macrame length around the mirror. Place the end of the macrame on the middle of one side. 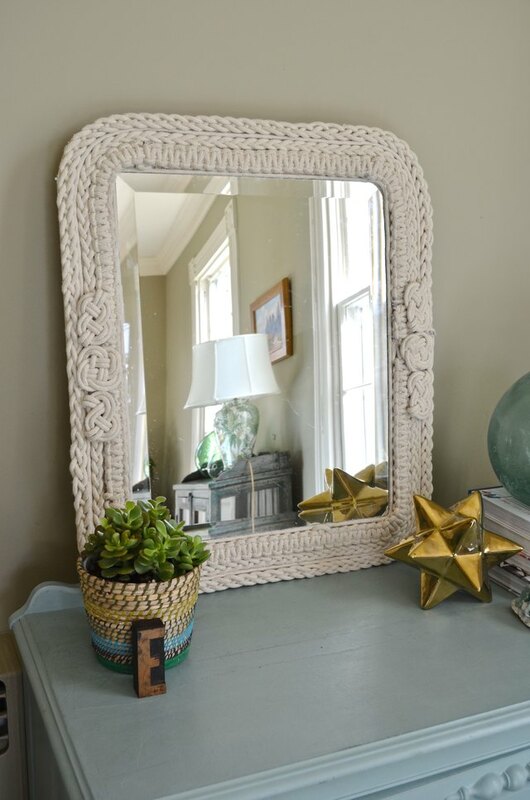 Apply a liberal amount of Liquid Nails and slowly press the macrame down as it wraps around the mirror. 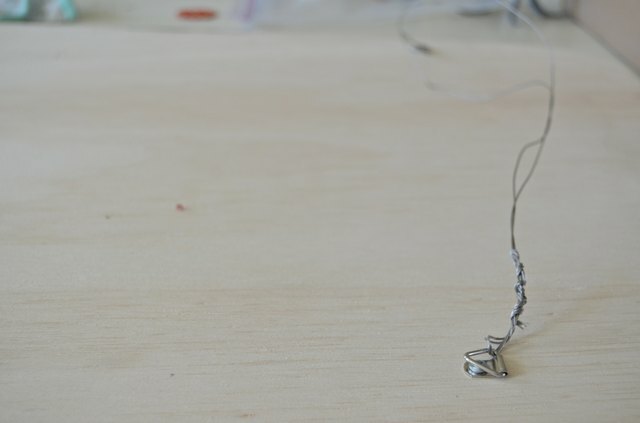 If needed, use the hot glue gun to help hold the macrame in place while the Liquid Nails completely sets (overnight). Small brad nails are helpful to keep the various braids in place and tight against each other around the mirror. 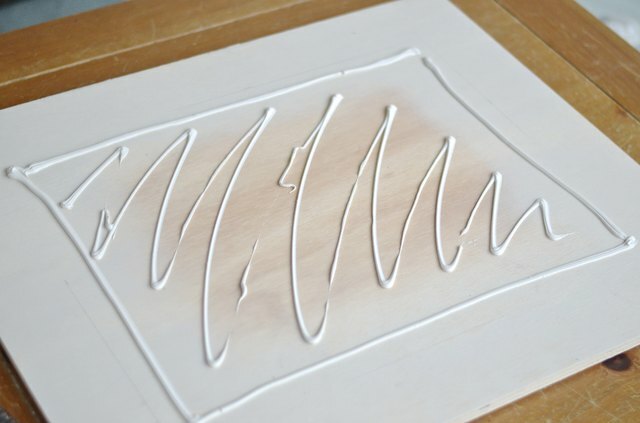 Gently tap them in place with a hammer and leave in place until the glue has set overnight. Remove when the glue has dried. Repeat Step 11 with the simple braid. Start at the same place on the edge of the mirror. These rough ends will be covered up later so it is important that they are aligned. Glue one single strand of rope around the braided length. Glue the final intricate braid around the mirror as in Steps 11 and 12. With the hot glue gun, glue on the figure-8 knots and the clover knots to conceal the exposed edges of the various braids. Optional: With the jigsaw, trim the exposed corners of the wood. If a jigsaw is unavailable, then cover the exposed wood with more rope. Turn the mirror over and screw in hanging D-rings and wrap the hanging wire between them. 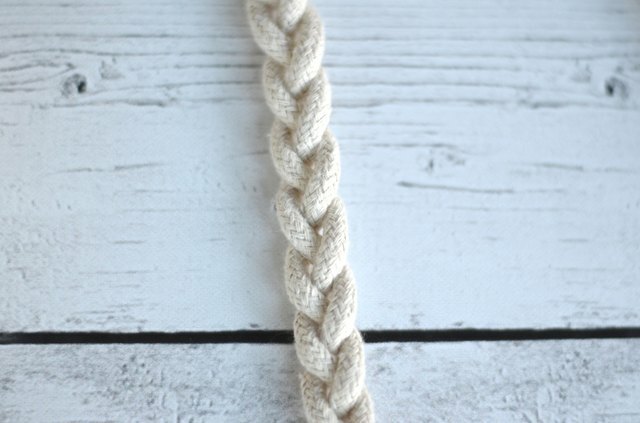 The texture and detail of the rope frame will stand out in any room. 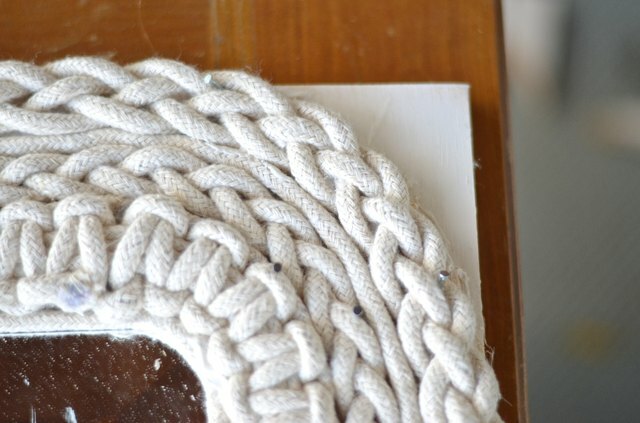 Because of the neutral color of the rope, this mirror complements most decor. 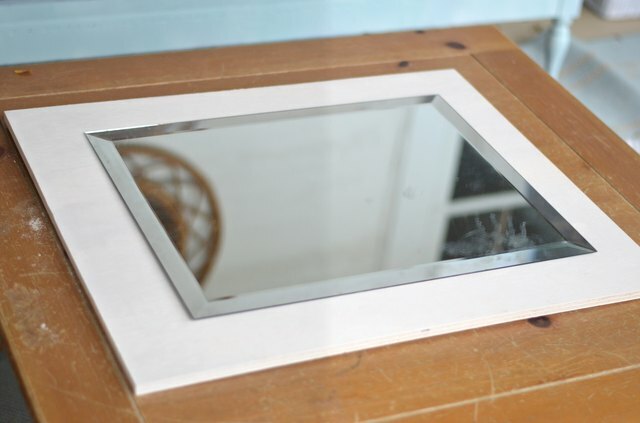 The mirror can be displayed horizontally or vertically. The decorative knots look just as chic on either side of the frame or turned to be on the top and bottom. Neutral texture at its best.